The rice cooker is a very useful kitchen equipment and is present in many Asian households. Whilst it is primarily designed to cook rice, newer versions of the rice cooker has enable cooks to use it for steaming and even boiling soup. Recently, my mum cooked Chicken Rice using the rice cooker. It is actually another version of the popular Claypot Chicken Rice. The beauty of using the rice cooker is that the rice does not get burnt at the bottom unlike the claypot. 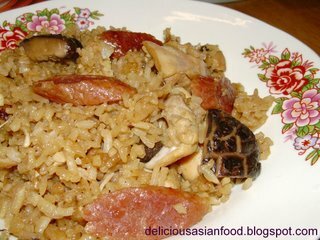 However, for those who are fond of burnt bits of rice, you may have to try this using the claypot instead. This is the recipe for Chicken Rice using the Rice Cooker. Soak rice in water for about 1 1/2 hours. Marinade chicken for the same length of time. With remaining oil in wok and at high heat, add pre-soaked chinese dried mushrooms and ginger and stir fry for about 1 minute. Add marinated chicken and stir fry for another minute. Add pre-soaked rice and seasoning and continue frying for about 2 minutes. Sprinkle a little bit of warm water to keep the rice from drying out. 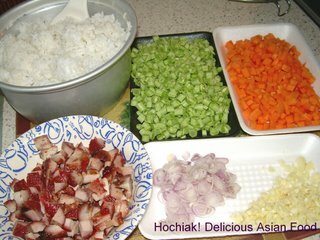 Remove rice with ingredients into the rice cooker. Place the lap cheongs over the rice. Pour water (previously used to soak dried chinese mushrooms) gently over the rice to cover the rice just like how you would usually cook white rice in a rice cooker. Add plain water if the water used to soak dried chinese mushrooms is insufficient. Turn on your rice cooker and let it cook. Serve hot and sprinkle fried shallots over the rice prior to serving. Note : As you learn to cook this dish, adjust the seasoning to your prefered taste. 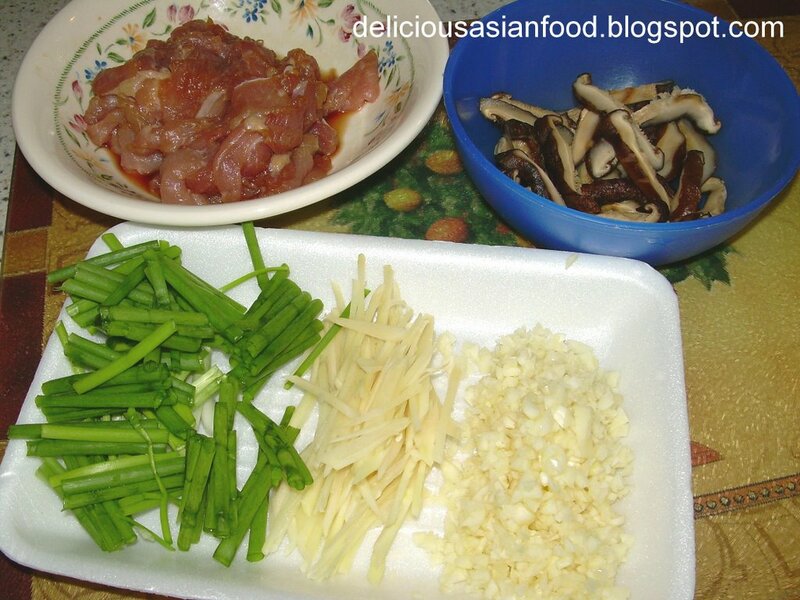 You can also sprinkle chopped spring onions over the Chicken Rice for added colour and taste. 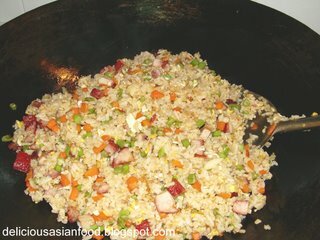 There are many variants of fried rice. In fact, it is only limited by the chef’s imagination. One of the most popular is Egg Fried Rice, a recipe which I previously shared in this site. Another way of frying rice is to add meat to it and this gives the fried rice a good dose of flavour. Sometimes, I will buy char siew (barbecued pork) from the market and use it as an ingredient in my fried rice. Most of the “tai chaus” (restaurants) also fry their rice this way though I must qualify myself and say that my recipe is more home-style and perhaps, different in some ways. Whilst the list of ingredients may seem long, it is actually not too complicated a recipe if you actually put your hand to it and try it for yourself. This is my recipe for Char Siew Fried Rice. Heat oil in wok and fry shallots till golden brown. Remove fried shallots and set aside. With remaining oil in wok and at high heat, add garlic, french beans and carrots and stir fry for 1 minute. Add salt and pepper. Make a “well” in the wok by pushing the french beans and carrots aside. Break eggs into the “well” and fry it till cooked. Mix with french beans and carrots followed by char siew. Fry and mix well for another 1 minute. Serve hot and sprinkle fried shallots over the fried rice before serving. Ginger and spring onions are the best of pals. Somehow, when combined, they compliment each other very well and gives the dish a good taste regardless whether you use pork, fish slices, chicken or beef. Today, I would like to share with you my recipe for Pork with Ginger and Spring Onions. Once you have mastered this dish, you can substitute the meat with chicken, fish or beef. Heat oil in wok. Stir fry the garlic and ginger for about 30 seconds. 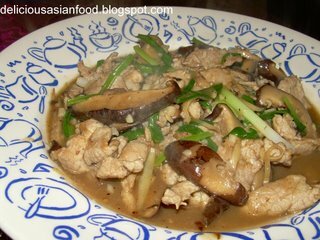 Add mushrooms and pork and continue to stir fry for about 2 minutes till pork is seared. Add sauce to taste and warm water. Cover wok for about 2 minutes. Add spring onions and corn starch to thicken the gravy to your liking. I’ve pondered long and hard what recipe or Asian food I shall blog about. After much thought, I decided to share with you the humble “Egg Fried Rice”. Why the Egg Fried Rice, you might ask? Well, for starters, the very first dish I learnt to cook (after “graduating” from frying eggs) was Egg Fried Rice. I was only 11 years old then. It is a simple dish and sure fills the stomach. It is also popular in most chinese restaurants and take-aways. This is my version of the no-frills Egg Fried Rice. Super simple and serves 2 persons. Heat one to two tablespoons oil in a wok and fry shallots till fragrant and light brown. Remove fried shallots. Whilst oil is still hot, add the rice and stir-fry well. Pour in seasoning and continue to stir-fry for about 3 minutes. Pour in eggs and fry until properly cooked. The rice should be coated and yellowish-brown in colour. Sprinkle the fried shallots over the rice. Dish out and serve with garnishing.